This image is a broad spectrum composite. It’s made up of an x-ray image from Chandra, an infrared image from Spitzer and an optical image from the Calar Alto telescope in Spain. It’s a cloud of intensely hot plasma and gasses, slowly recombining and condensing into high temperature cosmic dust. Yep — supernova condensate. Around 7500 light years away, this supernova remnant was left by a type Ia supernova. Something I’ve not written about much here before. Type Ia supernovae don’t leave the flamboyant nebulae (like the Crab) that their Type II counterparts do. One of the main reasons for this is that they come from an entirely different source. The progenitors of type Ia supernovae are white dwarfs. I’ll admit that I don’t know an awful lot about white dwarfs, but what the hell, I’ll give this a go… These tiny balls of massively condensed matter are supported by electron degeneracy pressure. Electrons, having the same charge, repel each other. In fact, by quantum mechanics, two electrons cannot occupy the same quantum state at the same time (this is known as the Pauli Exclusion principle). If all of that makes your head hurt, you can just think about it this way — you can only compress electrons so far. Past that, they push against each other, preventing you from compacting them any further. A consequence of this bizarre state of matter is that it’s extremely dense. So dense that other matter falling onto it is crushed instantly. Occasionally, when a larger chunk of matter falls onto a white dwarf, this causes a brief outburst of nuclear fusion. This sudden burst of fusion causes the white dwarf to seemingly flare up briefly as a nova, brightening dramatically before settling back down. The thing is, electrons can only hold up against the onslaught of gravity for so long. Specifically, they have a limit. Known as the Chandrasekhar* Limit, it sits at a mere 1.38 solar masses (more or less). If a greedy white dwarf accumulates enough material to exceed this mass, the electrons are no longer capable of supporting it all. The white dwarf collapses violently in on itself, liberating unimaginable amounts of energy in the process. So much energy, in fact, that the entire star is completely obliterated in an explosion far more powerful than any Type II supernova could ever be. Because in theory, these Type Ia supernovae are always caused by an object with the same mass, this means they always have the same energy output. Astrophysicists find this rather convenient, using them as standard candles with which to gauge distances on astronomical scales. It’s with measurements like this that we can estimate the age of the Universe at around 13.7 billion years… But I’m straying far from my knowledge comfort zone now, so I feel this would be a suitable place to stop. * Named after the man who devised it, an indian astrophysicist named Subrahmanyan Chandrasekhar. Incidentally, the Chandra X-ray Observatory is named after the same man! 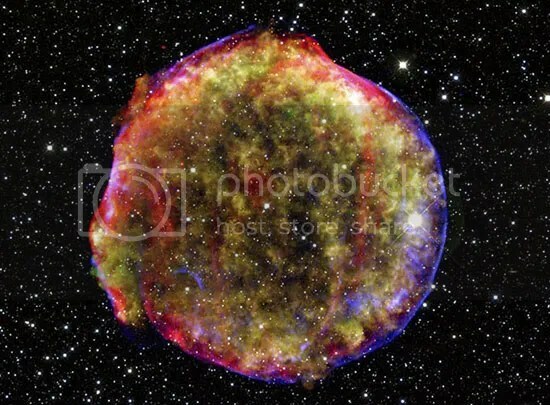 This entry was posted in Imported from Livejournal and tagged astronomical images, supernovae. Bookmark the permalink.